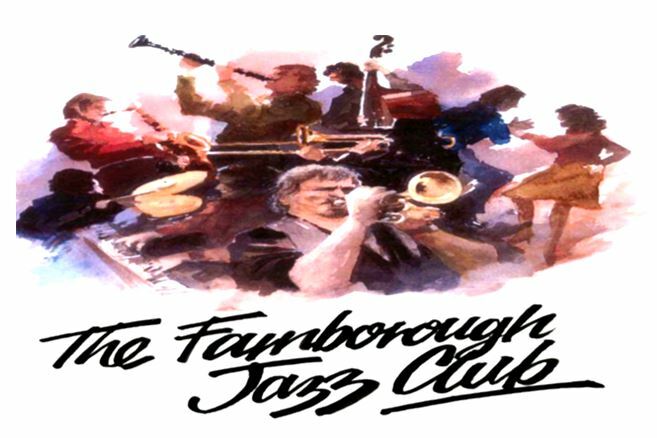 The famous ‘LAURIE CHESCOE’S REUNION BAND’ appeared on Friday, 6th December 2013 here at the Farnborough Jazz Club. Drummer Laurie had his usual band of musicians with him, namely ALLAN (aka ‘LORD ARSENAL’) BRADLEY on trumpet, piano & vocals, JOHN LEE on reeds, DAVE HEWITT on trombone, COLIN BRAY on piano/soprano sax, JIM DOUGLAS on guitar & banjo and PETER SKIVINGTON on bass ukulele. What a super line-up aye? Not so many of you turned up. I suppose Xmas parties, or perhaps a pantomime are to blame. Our own dear bar managers, Val & Harry were in ‘Jack & the Beanstalk’ pantomime in Knockholt. I saw them last Saturday and very professional and funny it was too. Well done to all the cast. However, all those who missed Laurie, missed a very entertaining evening, quite our very own variety performance. Lord Arsenal was very entertaining as compere and they started off with a rip-roaring version of ‘At the Jazz Band Ball’ just to set the standard. Allan then introduced the next number as ‘On the Sunny Side of the Street’. Our audient comedian, Len, called out “or ‘Just Wishful Thinking’ aye”. Allan played a lovely muted trumpet. Another number to mention was a Southern Ragtime one called ‘Memphis Blues’. Plus a Louis Armstrong number called ‘Bill Bailey’, sung by Allan. Dave played his baritone horn next to ‘Ida, Sweet as Apple Cider’, what a lovely sound too. Their next number was ‘L-O-V-E’. Allan changed places with Colin with Allan on piano and Colin on soprano sax. Colin was amazing, with his legs akimbo, what rhythm he has in his body, as well as being so talented – quite a genius. Nat King Cole recorded this number in 1964, who sadly died just one month later. The next number I want to mention just happens to be one of my all-time jazz favourite, called ‘Christopher Columbus’. If that wasn’t enough, John Lee was featured in the next number, ‘Guess I’ll Hang My Tears Out to Dry’ and this number’s composer went on to composed for both Sinatra & Streisand, both my all-time favourite singers. ‘Move your Body Over’ came next, again with Colin on soprano sax and Alan on piano and vocals. I wondered why there was an ironing board amongst their kit, but then forgot it. However, it became obvious it was for the next number! Colin showed us once again what a performer he is! He proceeded to set up this ironing board, then out came a Xylophone and Colin played it magnificently to ‘China Boy’ (again with Allan on piano). My last number to mention was Jim featured on guitar with ‘That’s All’. Just another evening of great music and dancing once again. Laurie certainly kept the whole evening going with his drumming (and continual smiling). That’s why I said ‘yippee’ last week! This entry was posted in Laurie Chescoe's Reunion Band on December 11, 2013 by Diane.